The DescoAV Theater Room just got a major upgrade, and you need to hear it to believe it! We just installed Dolby Atmos. To say Dolby Atmos is “the next generation of surround sound” is good marketing hype, but is it really that different? Our answer is a resounding “yes.” Dolby Atmos has reinvented surround sound. It’s been a long time since there have been such radical new advancements in the way we experience home entertainment. Remember when you first heard Dolby Digital Surround Sound and thought “Whoa…that’s amazing!” as the sound traveled from one corner of the room around you to the other and then hit you from all channels? Dolby Atmos will simply astound you! The key concept is that Dolby Atmos frees sound from being confined to channels. It’s the first audio format in which sounds exist as individual entities, called audio objects. In Dolby Atmos, any sound—a helicopter, a car screeching around a corner, a melodic bird call—can exist as an independent audio object, free of channel restrictions. They can be precisely placed and moved anywhere in your room, including overhead, to flow above and around you in three-dimensional space. In Dolby Atmos, you don’t just hear glass break, you hear each shard flying past you. The future of home cinema is here. 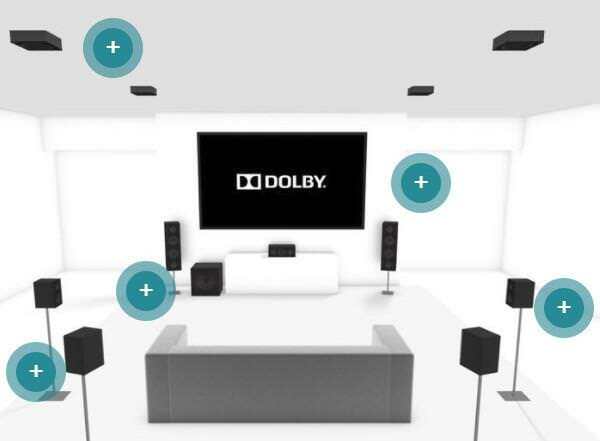 Dobly Atmos creates an intensely immersive surround sound experience. Moving Audio That Flows Around You – You’ll feel like you’re inside the action as the sounds of people, music, and things come alive with breathtaking realism and move all around you in three-dimensional space. 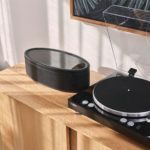 Support for up to 128 Simultaneous Audio Objects – Sounds exist as independent entities and can be placed and moved independently and precisely anywhere in your room, including overhead. Compatible with Your Existing Setup – Dolby Atmos® content is fully compatible for playback on a conventional stereo and on 5.1- and 7.1-channel systems. 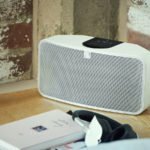 To get the full experience, you can easily build on your current surround sound system. A Dolby Atmos audio/video receiver (AVR) expands the cinema experience to your home theater from six speakers to as many as 34. A Growing Library of Content – As movie directors increasingly choose Dolby Atmos for their soundtracks, you’ll find a growing library of movies and other content on Blu-ray Disc™ and online from premium services. Hearing is believing. Come into our showroom and experience the magic of Dolby Atmos in our Home Theater Room. You will be amazed at how incredible it sounds!